Police forces in England and Wales face cuts in central funding in the next two years of 4% then 5%, the government has announced. Policing Minister Nick Herbert said front-line services could be protected while achieving "challenging" savings. Central funding will fall to £9.3bn in 2011-12, then £8.8bn the year after. The Association of Police Authorities said it could stall progress on crime reduction. Shadow home secretary Ed Balls called the cuts "very reckless". Mr Herbert said the government would "play its part by reducing bureaucracy, driving more efficient procurement, and working with forces to ensure that the savings of over £1bn a year identified by Her Majesty's Inspectorate of Constabulary are delivered". In real terms, taking into account changes in purchasing power over time, the cuts equate to 6% in 2011-12 and 8% in 2012-13. Mr Balls told BBC News: "What we have seen today announced to all forces - and to be honest rather hidden behind the other announcements on local government and schools - is the biggest cut to our police for a century, outside of wartime." Pointing to a Police Federation warning that thousands of front-line posts could be lost as result of the cuts, Mr Balls said: "In this debate about cuts, sometimes when people come on to your programme and talk about percentages here or millions there, it's all a bit meaningless. "Twenty thousand police officers gone from our streets - that's real." 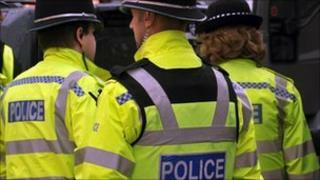 The policing minister announced separate funds for counter-terrorism, and for neighbourhood policing until 2013. A prioritised budget for counter-terrorism would see £567m allocated for 2011-12, it was announced. Mr Herbert announced a further £600m for "safety and security" during the London Olympics in 2012, although he said the government was confident that could be delivered for £475m. The separate neighbourhood policing allocations are worth £340m in 2011-12, and £338m the following year. The Association of Police Authorities (APA) chairman, Rob Garnham, welcomed the decision to maintain the counter-terrorism and neighbourhood policing funds. But he said: "There can be no doubt that the financial prospects over the next four years remain daunting. "There is a risk that the positive momentum of the last few years on crime reduction and public confidence will be interrupted, at a time when communities are likely to be looking more towards the police for help when other public services are scaling back." It was also likely that public services and voluntary groups would be cutting funds that had traditionally supported police-led initiatives, leaving forces "squeezed from several directions at once", Mr Garnham warned. While acknowledging the need to cut expenditure in the police service, the APA has urged the government to rethink how the cuts are phased over the four-year period. It believes that if budgets are slashed too heavily too early, it will damage police forces' abilities to transform their working practices and make savings that way. With the cuts currently scheduled by the Home Office, Mr Garnham said: "It is difficult to envisage how some loss of service can be avoided."